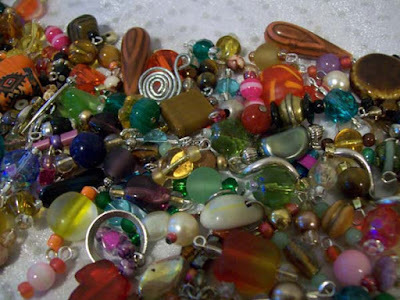 So, a couple days ago I was thinking about making some more charm bracelets and decided it would be a good idea to make up a variety of the bead sets in different colors and then I could lay them out with a variety of the found objects and just create to my hearts intent. 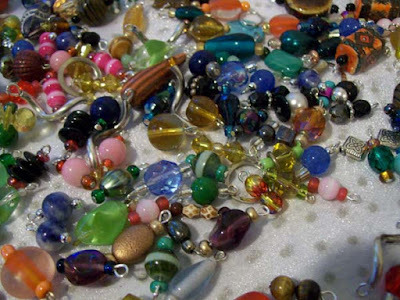 Well, I made a few beadsets and was having a pretty good time so I made some more, and then some more the next day and the next day. Today I had to force myself to a halt ... like how many do I really need anyway. Besides, since I've been cutting some stained glass (a whole other story), I've been thinking about trying my hand at copper foil method for some little pendants to put on the bracelets. Beau & I even drove over to Slidell to Hobby Lobby so I could put up some foil and solder (in the pouring down rain, might I mention).